Alex Bowen’s late night adventure has made national news. On Nov 30, Bowen claimed to be unable to sleep. 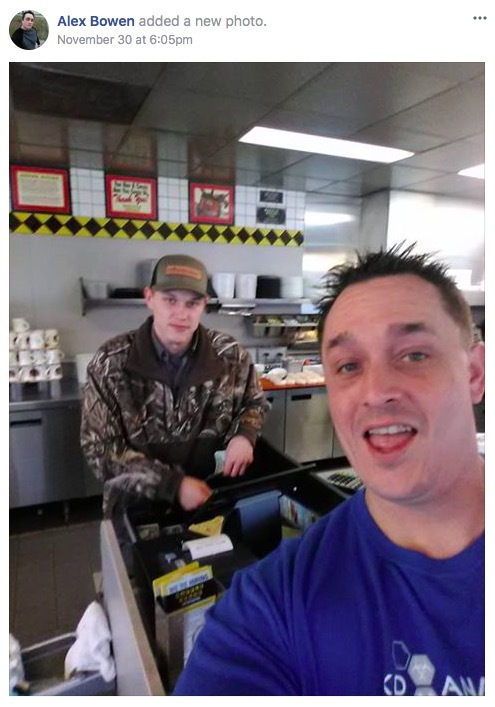 So, the South Carolina man popped into a local Waffle House. The all-night diner was empty. No customers or employees in sight. Then, the sleepless and hungry man spotted a cook curled up in a booth. Instead of waking the worker, Bowen stepped into the kitchen and started cooking his own meal…snapping selfies along the way. Lest you think Alex Bowen would do a (cook) “dine-and-dash” on the Waffle House, he returned the next day to pay for the sandwich. For the record, Bowen admitted his inspiration may have come from a bottle, “I give all the credit to my old friend vodka,” Bowen told WIS-TV. What happened to the sleeping employee? Waffle House suspended the worker for a week and is “investigating” the incident. Next Post:Monday’s Podcast Menu: Trump’s tweets, the Communist Revolution plan, and a cursing mom in hot water… something for everyone!